WISDOM TOOTH: "RIDING THE BRAIN WAVES"
Jesse Sposato wrote a really great review of the newly-debuted print + zine collection at Storefront, BRAIN WAVES. 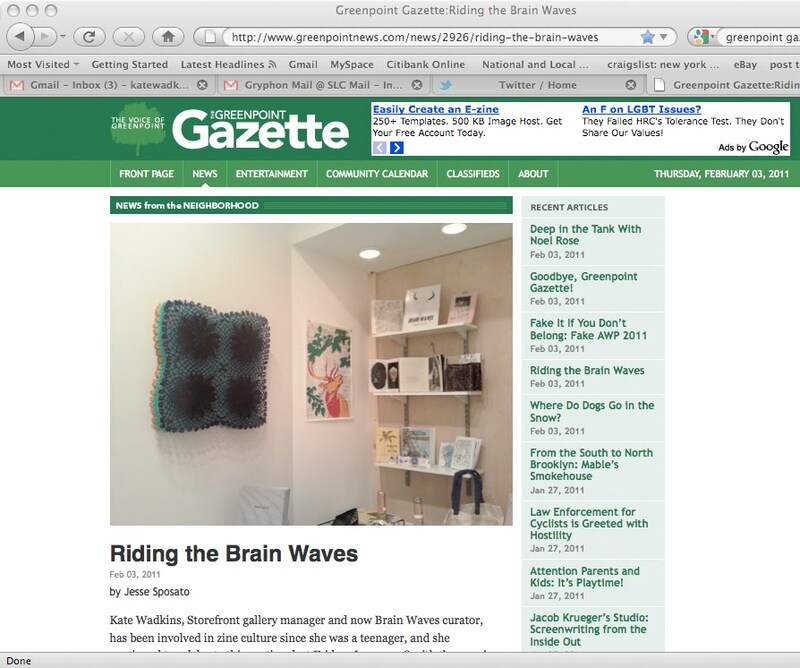 You can check it out at the Greenpoint Gazette. Kate Wadkins, Storefront gallery manager and now Brain Waves curator, has been involved in zine culture since she was a teenager, and she continued to celebrate this pastime last Friday, January 28 with the opening of Brain Waves, Storefront’s zine and print collection. Storefront, which just celebrated its one-year-anniversary, was a triple threat on Friday. In conjunction with the Brain Waves opening, there was also Mary Judge’s solo show, Pop-Oculus that took place in the front room, and Wavelength, a group show in the back featuring works by Judith Braun, Maureen McQuillan and Susanna Starr. “[Wavelength] was kind of part of the impetus of having Brain Waves open at the same time. We just thought it was too much of a coincidence to have Wavelength and Brain Waves [open simultaneously],” Wadkins said. Wadkins, along with Storefront founders and directors Jason Andrew and Deborah Brown, is using Brain Waves as yet another platform for artists within the space. “It [is] a really good opportunity for me to be able to tap into all the things that I [see] going on and give people just one other way to get their work out there,” Wadkins said. The collection is going to be rotating and the goal, as of now, is to have a new zine every month with a corresponding opening.